How do you efficiently build a fantasy world for roleplaying games? World building for roleplaying games can be a massive undertaking, and you can put countless hours into it, so you need to figure out much depth and scope you want or need. What are your goals? How can you improve your world by asking questions? Do you want to present the world as facts, or do you use unreliable narrators? I gave the logline some thought in a previous post. The logline is your hook for the setting, and you need to use that hook as you hash out the details. The following is a few ideas to make efficient choices and how you go about building your world. You have two options designing your world: top-down or bottom-up. In brief, top-down means developing the whole world, or at least a more substantial part of the world, before focusing on local areas. Bottom-up means that you start with a small area, then expand the horizon as your story requires it. The Dungeon Master’s Guide (2014) suggests bottom-up by establishing a home base, the closest village, a couple of dungeons, and build from there. For the most part, I agree with this approach. Matthew Mercer of Critical Role said in an interview with D&D Beyond he started Tal’Dorei as a one-shot, and it grew from there. He did not go into his plans at the time, but it would have made sense to start small considering given his modest ambitions at the time. I started small when I first began working on my world back in 86-87. I drew a big island located in the northern hemisphere, decided with was somewhat like medieval Europe, and then zeroed in on a big city. I conjured up mental images of old Mediterranean cities, perhaps like Nice or Venice, I made up some fancy names, and I was ready for my first adventure in my world. My first adventure in the setting was a hunt for a thief. I had run a few in old Karameikos, but I do not recall any of it. I do remember the first adventure in my world on the other hand. The first character was a paladin, and he was looking for a thief. The paladin tracked down the thief and chased him through the city, had a run-in with a grumpy city guard captain until the paladin finally caught the thief somewhere in the countryside outside the city. The setting and the adventure was both forgettable, but I think the approach is sound even today. I started big to get the big picture, then narrowed to just one location, and built from there. I got a city with some local color, crossed the city limits and got into the countryside beyond, with only a few hours’ efforts, and was rewarded with a few hours of fun. My only regret from that setting and adventure was my inconsistent naming for places and people, but that is a topic for another post. Consider the 80/20 rule, also called Pareto Principle, before you spend hours writing your 20 000 word backstory on fallen gnomish gods. The 80/20 rule says you get 80% of your output from only 20% of your input, which means there is a considerable drop of utility for every hour you spend world building or preparing your game. I do not mind world building as a creative outlet (gotta love those fallen gnomish gods). However, if you want efficiency, focus on 15-minute brainstorming for the setting. Then proceed to craft your adventure, and add setting details as the adventure requires. Some folks just want to see the world burn, and that is perfectly fine. One of my favorite subplots in a past game came out of nowhere during a city adventure. One of the characters started out with a mistress, a bored baker’s wife, as part of his backstory. We briefly stated that the pair had met a couple of times in secrecy. The mistress knew the city well and was an excellent source of information. She quickly became a recurring character. Then the fun part occurred. Out of nowhere, it turned out that the bakery was an important member of the baker’s guild, and there was an intense power struggle inside the guild. People had been killed, and the ambitious baker and his wife stayed in a loveless marriage to get ahead of the other members of the guild. People had gone missing, and the baker’s wife could use a mercenary as well as a lover. The character even spotted dried blood on a flour sack as they fucked in the bakery storage. Later she hinted her husband was a “problem.” The mistress unexpectedly moved from bored and informative, to possibly murderous. Sadly the campaign changed direction, and we never figured out whatever happened with the baker guild war. Such an opportunity wasted. The investigation lasted 3-4 sessions, and the details of the actual adventure are mostly forgotten and would have been lost entirely if not for my journal. But this spontaneous little drama with the mercenary, the baker, and the baker’s wife sticks with me still, five years later. Unfortunately, the campaign changed direction, and we never figured out whatever happened with the baker guild war, the baker and his bored wife. Such an opportunity wasted. The investigation lasted 3-4 sessions, and the details of the actual adventure are mostly forgotten and would have been lost entirely if not for my journal. But this improvised drama about the mercenary, the baker, and the baker’s wife sticks with me still, five years later. It was collective storytelling at it’s best and had required absolutely no preparation except coming up with a few character names and the name of the bakery. Asking questions maps out the basic information about any topic in your world. Like in journalism, this means figuring out whats going on and why. Asking questions irons out wrinkles in your backstory and force you to make decisions where you otherwise would have left problems unresolved. It also forces you to face cliches and make up your mind on what you want from your world. Consider our fantasy stalwarts the Mentor, the Black Knight, and the Dark Lord. No fantasy can be without these guys. Right? Right! Let’s answer the questions above for each of these tropes. What are the subject’s origins? Where is the subject currently? What are the subject’s relationships? Who are the subjects mentor or master, if any? What is the subjects livelihood? What are the subjects current activities? The Mentor comes from the Northlands. She is roaming the Great Kingdom looking for the One Crown. She travels alone but has friends everywhere, and many authority figures hate her. The Mentor follows the Arcane Order, an ancient society of wizards and sages. She seems unconcerned with employment or even wealth, yet she always has enough tobacco for her pipe. The Black Knight is a fallen and corrupted baron of the Great Kingdom. He is hiding in the foothills of the Northlands, building an army. The Black Knight killed his own family, and are allied with orcs, brigands and possibly the Other Black Knight. The Black Knight serve the Unholy Ones, who undoubtedly hide his whereabouts. The Black Knight is gathering an army to destroy is former home, the now hated Great Kingdom. The Dark Lady is a beautiful fallen angel, now cast out of heaven. She is sleeping deep underground, awaiting her imminent return to the surface world. The angels fear her, the Unholy Ones hates her, and the orcs wait for her to set them free. The Dark Lady has rejected her master, but the Lords of Heaven taught her. She is currently sleeping, growing in power, and feeding on sacrifices. For another example, let us ask the same questions about our fantasy tropes the elves, dwarves, and orcs. The problem is that they are overdone after 50 years of fantasy fiction, so I have to make sure they are adequately embedded in the world if I want to include them at all. So again I’ll try to answer some of the questions above. The elves came from another world at the dawn of time. They live in the forests northeast of the Great Kingdom. They are friendly with the Northmen, uneasy with the Great Kingdom and at war with the orcs. The elves do not worship gods but revere their ancestors. The elves’ great undertaking is constructing a magic Crystal Gate that connects this world and their origin world. The dwarves are native to this world and have an affinity for earth and stone. They live in the mountains of the Great Kingdom. The dwarves are friendly to the Great Kingdom, enemies with the Northmen and hate the elves passionately. The Elemental Titans taught the dwarves and later betrayed them after the demons corrupted them. The dwarves are skilled alchemists and merchants, with safe and profitable underground trade routes. The orcs are native to this world, and evil forces corrupted them in ages past. The orcs live beyond the eastern mountains and push westward through underground tunnels. They are hostile to just about everyone, except for southern raiders who supply them alchemical goods. The orcs serve the Unholy Ones, ancient gods bent on destruction. The orcs live on raiding and are preparing for another major attack on the elves. So are these the characters you want to your story? Sounds bland? Ask more and better questions! Another round of questions will dig deeper and hopefully reveal something worth keeping. Why did the Black Knight kill his own family? Why did demons corrupt the Elemental Titans? Why was the Dark Lord cast out of Heaven? What is the relationship between the Dark Lord and the Unholy Ones? What happens if a Crystal Gate malfunctions? Who is the scariest, the Unholy Ones, the corrupted Elemental Titans or the Dark Lord? What is the relationship between the Arcane Order and the Lords of Heaven? What do the dwarves think about the Dark Lord sleeping in their beloved underground? Why does the Great Kingdom tolerate the southern raiders? Sound familiar? Change the answer if it does not satisfy. Still bland? Maybe I should reconsider adding them to my world. You can make an informed decision once you have run out of questions. Feeling overwhelmed? That is a warning sign. Info dumps are not good storytelling. Explain what you need to get the story moving. Explain the rest as needed. It is ok to be vague on the details as a storyteller. That does not mean that you as the world builder should be vague. If you have a plan and are consistent, your world and story will benefit. Your audience will get the pleasure of figuring out the mystery instead of you just giving them the answer. Consider the “facts” as you present your world. Facts can be tricky, even in the real world, and even more so in an imaginary world. It is probably a good idea to establish facts when you create your world. Who killed whom, and when. What is the favorite cuisine of Sea Princes of the South? Are the orcs green-skinned or grey skinned, or both and why? The presentation, on the other hand, does not necessarily need to be factual. Unreliable narrators are a way to tell the story where the story cannot be trusted as it is presented. For example, in the BioWar computer game Dragon Age II, the story is told in a framed narrative told by the dwarf Varric. We still do not know what happened by the time we have finished the game dozens of hours later. We only know what Varric chooses to tell Cassandra, his audience in the game. Another trick from the Dragon Age franchise is including setting codices with an in-setting voice. You never know what is true, unless you experience it firsthand with your in-game protagonist, and even them facts may be unclear. Another example is the Elminster’s Notes in the first edition Forgotten Realms books, where Elminster gives us his take on the world we read about. His thoughts. Elminster many not be a guy to be trusted. Unreliable narrators are valuable GM tools. They are essential both because NPCs are not all-knowing, and the GM may have a poor memory. You can make up stuff and not care whether it is true! My NPCs was generally all-knowing when I started out as a GM. Today they do not know a god damned thing, but usually pretend they do. I started small when I first started my world. In hindsight, I would have followed the same approach today as I did when I first started. Starting small and focusing on only what I need is good advice. I need to start simple, as I both overthink and add layers quickly, so my world benefits from starting as small as possible. Background and details will stack up quickly once you get started. Still, there are two things I would have done differently. First, I would make a continental sketch at the beginning. Nothing elaborate, but with general regions and significant geographical features. This is helpful because this makes sure your starting area fits later additions when you consider languages, trade, climate, technology and so on. This continental sketch defines the starting area and highlights differences from later regions. If you do not give this any thought, you might end up with a bland version of medieval Europe everywhere, when you wanted distinct regions with seafaring Northmen in one area, holy knights in the second area, the orc lands as the third area, grubby merchant princes in the fourth area, and so on. Second, I would have cut more tropes at the start. I used the basic D&D 1983-version starting out with few changes. Which means gnomes, halflings, flying carpets, fly and teleport spells, djinnis and all kinds of stuff that does not fit my later idea of a cool and gritty sword and sorcery world. Sure, nothing retcons can’t fix, but getting it right the first time around is better. Philip Athans‘ The Guide to Writing Fantasy and Science Fiction: 6 Steps to Writing and Publishing Your Bestseller! (2010) is a good read for anyone interested in writing fantasy. Athans is a familiar name for anyone reading Forgotten Realms novels. Randy Ingermanson and Peter Economy‘s Writing Fiction for Dummies (2009) is worth checking out if you are looking for an all-in-one guide to the basics of writing fiction. 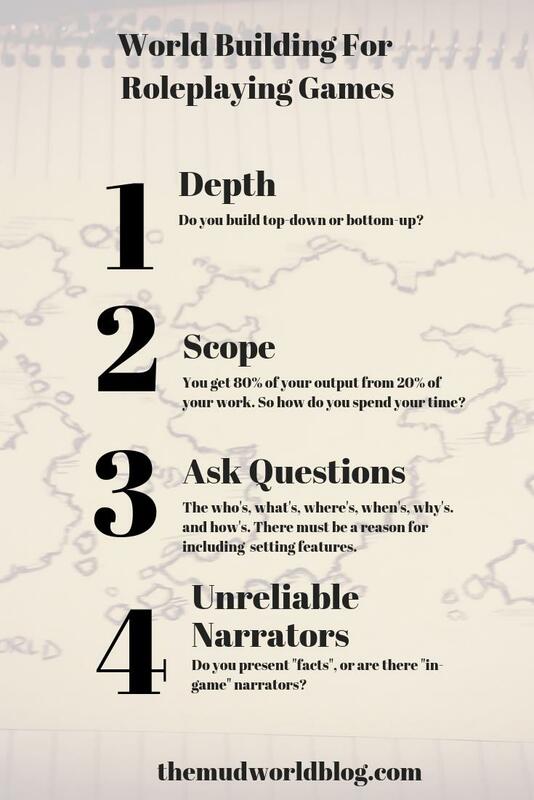 It covers a lot of ground for a newbie writer. Speaking of Varric and Dragon Age, BioWare and author Mary Kirby have released Varric’s book Hard in Hightown (2018). The main characters are Varric’s version guardsman Donnic, the possible husband of game companion Aveline. The book is worth checking out. It is a crime story with a satirical edge inside a framed narrative, told by an unreliable narrator. It makes my head spin. The World Builder’s Guidebook (1996) by Rich Baker is worth checking out for anyone interesting in building a gaming world. The books offer 96 pages of solid advice on world building and a booklet of worksheets and map grids. Although it is an Advanced Dungeons and Dragons book, the game references are minimal. This book is for designing the world, regardless of system. The Dungeon Master’s Guide (2014) warrants a mention as it is the core book for Dungeons and Dragons game masters. That said, it is surprisingly light on the topic of world building. The Pathfinder GameMastery Guide (2010) may, in fact, be a slightly better book for world builders. The two books are both excellent, but your mileage may vary depending on your game system of choice. Hm. I am pretty sure there was a joke there somewhere, but it appears to be lost somewhere along the way. Self-loathing dwarves? Thorin Oakenshield would not approve. So…They are natural enemies. Like northmen and dwarves! Or elves and dwarves! Or orcs and dwarves! Or dwarves and other dwarves! Damn dwarves! ..how Innocent we were….but as we grow older we want to compose even more eleborate plots..while still keeping it light…and so a session with dice and drinks might prepare us for our own Manifest Mysteries..